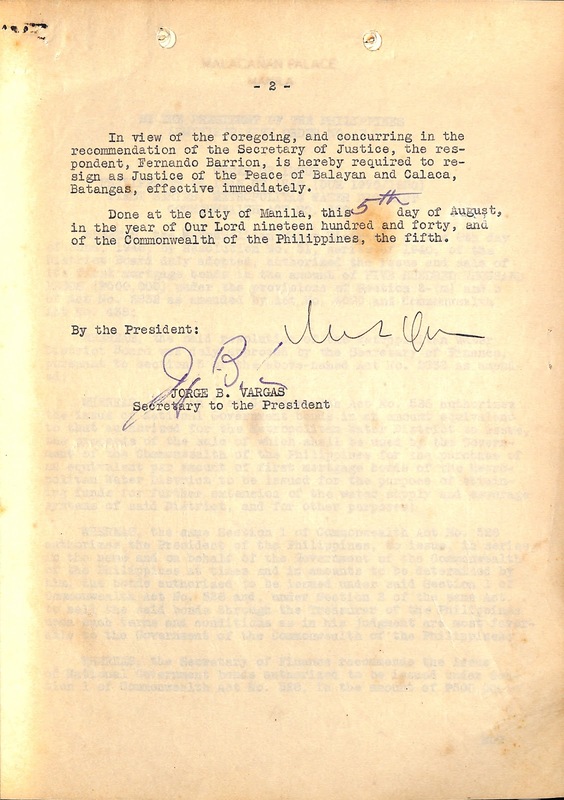 In the year 1940, the administration of Commonwealth President Manuel L. Quezon forced one Fernando Barrio, Justice of the Peace of the towns of Balayan and Calaca to resign his position after having been found guilty of partiality in the performance of his duty. 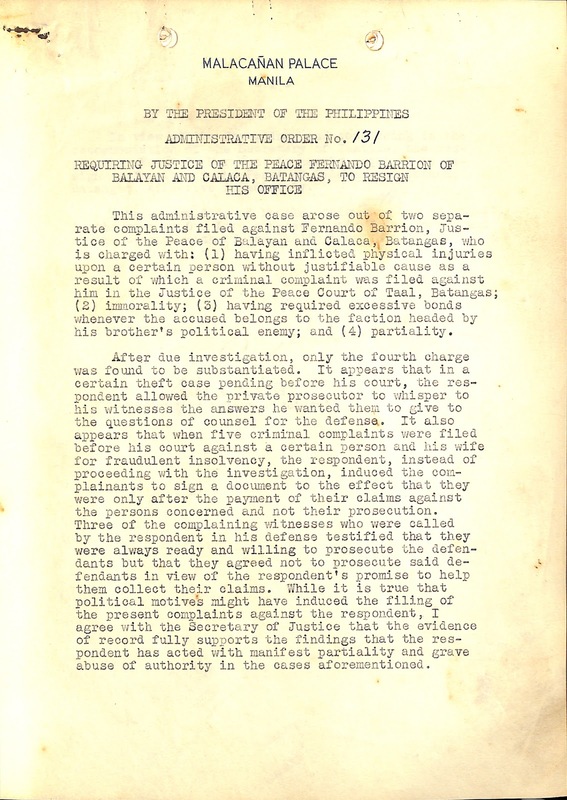 This was just one of four charges filed against Barrion, but given that the Justice of the Peace was a judicial officer1, it was sufficient grounds for the administration to call for him to quit his post. 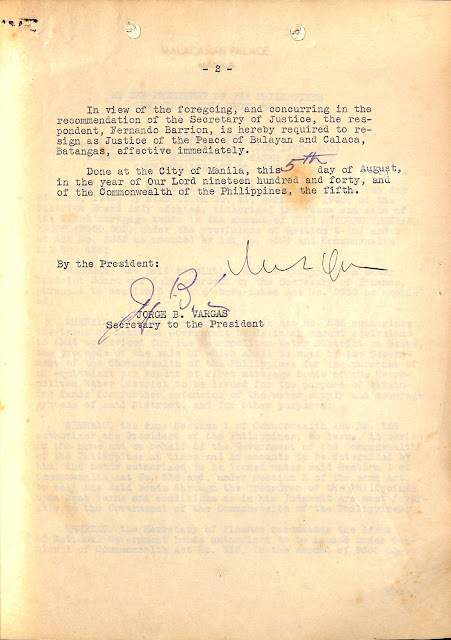 The contents of the administrative order2, signed by Quezon and Jorge B. Vargas, Secretary to the President, are provided below, along with scans of the historic document below the text. 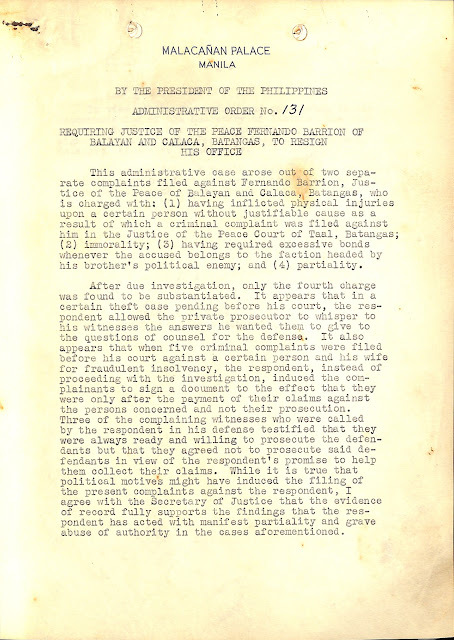 This administrative case arose out of two separate complaints filed against Fernando Barrion, Justice of the Peace of Balayan and Calaca, Batangas, who is charged with: (1) having inflicted physical injuries upon a certain person without justifiable cause as a result of which a criminal complaint was filed against him in the Justice of the Peace Court of Taal, Batangas; (2) immorality; (3) having required excessive bonds whenever the accused belongs to the faction headed by his brother’s political enemy; and (4) partiality. After due investigation, only the fourth charge was found to be substantiated. It appears that in a certain theft case pending before his court, the respondent allowed the private prosecutor to whisper to his witnesses the answers he wanted them to give the questions of the counsel for the defense. It also appears that when five criminal complaints were filed before his court against a certain person and his wife for fraudulent insolvency, the respondent, instead of proceeding with the investigation, induced the complainants to sign a document to the effect that they were only after the payment of their claims against the persons concerned and not their prosecution. 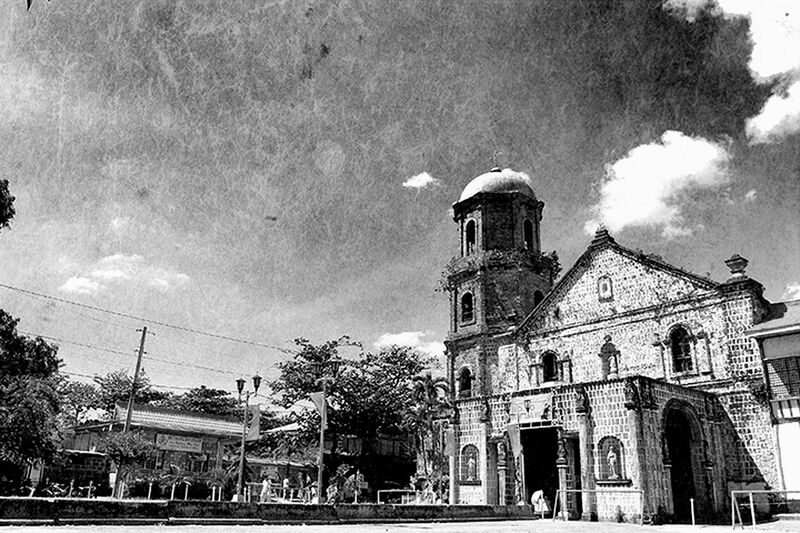 Three of the complaining witnesses were called by the respondent in his defense testified that they were always ready and willing to prosecute the defendants in view of the respondent’s promise to help them collect their claims. While it is true that political motives might have induced the filing of the present complaints against the respondent, I agree with the Secretary of Justice that the evidence of record fully supports the findings that the respondent has acted with manifest partiality and grave abuse of authority in the cases aforementioned. In view of the foregoing, and concurring in the recommendation of the Secretary of Justice, the respondent, Fernando Barrion, is hereby required to resign as Justice of the Peace of Balayan and Calaca, Batangas, effective immediately. Done at the City of Manila this 5th day of August, in the year of our Lord nineteen hundred and forty, and of the Commonwealth of the Philippines, the fifth. First page of Administrative Order No. 13 series of 1940. Second page of Administrative Order No. 13 series of 1940. 1 “Justice of the peace,” Wikipedia. 2 “Administrative Order Nos. 117 168 ( 1940 1941),” online at the Internet Archive.